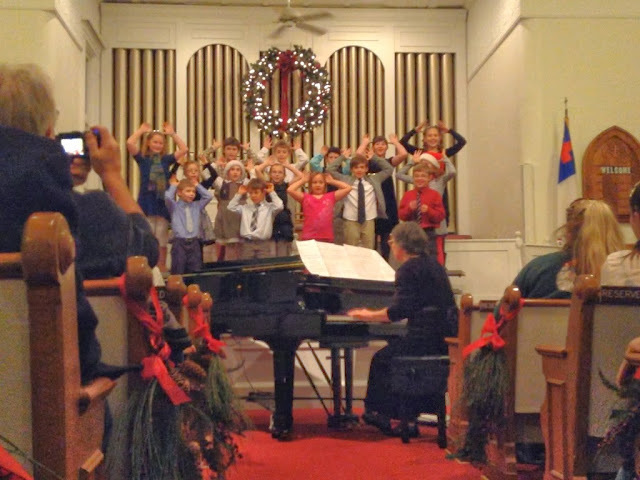 Last night Nina's chorale group performed their Christmas concert at the Congo church. Adorable! They sang two songs--Reindeer on the Roof and Una Luna Brillo. I took video, but here's a screenshot of that. I'll try to upload the videos to youtube this weekend. They made little antlers with their hands when they said "reindeer." Too cute! Nina's the one in the Santa hat and dirndl. Yesterday Maggie also had her class's performance of 'Twas the Night Before Christmas. I'll get those photos on as soon as I can download them.